The Family TG is intended for fully automatic measurement of Capacitances and Power Factor of the insulation of high voltage apparatus. The measuring principle is based on the classical Inductive Current Comparator balancing. The instruments are compact. For a standard measurement only the instrument and a HV Standard Capacitor is necessary. The instrument in basic setup can measures capacitances from some pF up 100 mFarad, from some 10 volts to 1 Million volt, with an uncertainty of 10 ppm in value and in phase. For basic measurement you need only the bridge, for higher ranges as e.g. 10’000 A an additive current transformer. Additive unit as shunt resistors, adapters are not used. It is a magnetic comparator based instrument working at 50 and 60 Hz (16 2/3 Hz is option). The Comparator Principle guarantees the low uncertainty in a very large span of ranges. The basic bridge has a range domain of 1, 10, 100 and 1000, with range extension up to 10’000. 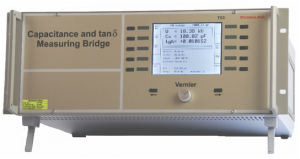 Using the bridge for testing power capacitor, the range can be enlarged up 1:107, the input current up to 10 kA. The bridge works also by grounded object, in four –poles mode. No loss of precision! A greet practical advantage is the downstage hardware compatibility: if you have a Schering Bridge or a comparator bridge of the old Tettex, H&B or Siemens constructions, simply you pull the X and N cables from the old instrument, push they in a TG, switch on and it works! The instrument has a fast RS232 interface, a standard processing software for PC and the user can write the own service program.